Becoming a gardener is a journey. It is a journey of discovery; a journey of evolution. To begin with a bit of dirt, a splash of water and a tiny seed or leaf or stem or root, and coax that living tissue into a beautiful and productive plant, is a journey, too. And every answer she discovers leads to more and more interesting questions. The journey lasts a lifetime. From the first seed sown in a bit of mud as a child, to the creation and care for garden upon garden upon garden throughout one’s life; the gardener herself ripens as the journey continues. There are salads to grow and herbs for cooking. We plant flowers, fruit, mosses, ferns, roses, grasses and graceful trees to flower in early springtime. There are long and twisty names to learn; and knotty, weedy problems to resolve. We learn to shape a plant with skillful pruning. We have soils to amend, mulch to spread, oils to spray and compost to make. There is always more to learn, and there are always tasks waiting for us to accomplish, along the way. Some gardeners choose to quietly tend their own gardens. They make their journey largely on their knees, coaxing the earth into fertility and abundance. They lay their daily table with the fruits of their devotion. Some gardeners create something new. They play matchmaker in their beds and breed new and better and different and healthier plants to introduce to the horticultural world. Some design and some construct. Others experiment with new ways to adapt to a changing environment, and find ways to increase the land’s productivity. Some raise quantities of plants to supply to others, and create beautiful nurseries to inspire their brother and sister gardeners. And some gardeners share what they have learned with others. They pass along plants, offer advice, and help other gardeners find answers to their questions. It is all a part of the journey: Asking, learning, propagating, teaching, sowing, amending, pruning and investing one’s energy in making something grow; making a place more beautiful. A gardener works to heal the planet. We create beautiful spaces for people and safe spaces for wildlife. We nurture plants to cleanse the air and perfume it. We plant to build and hold the soil and purify the water. We feed our families and ourselves. If you find yourself somewhere along this path, then you are on a journey of happiness and good fortune. And feel your own roots and branches expanding ever further into this beautiful world we share. when people must know when not to let go. Rhododendron re-blooms in October at the Connie Hansen Garden Conservancy. Mussels grow amid barnacles on rocks jutting up through a sandy beach on Oregon’s central coast. 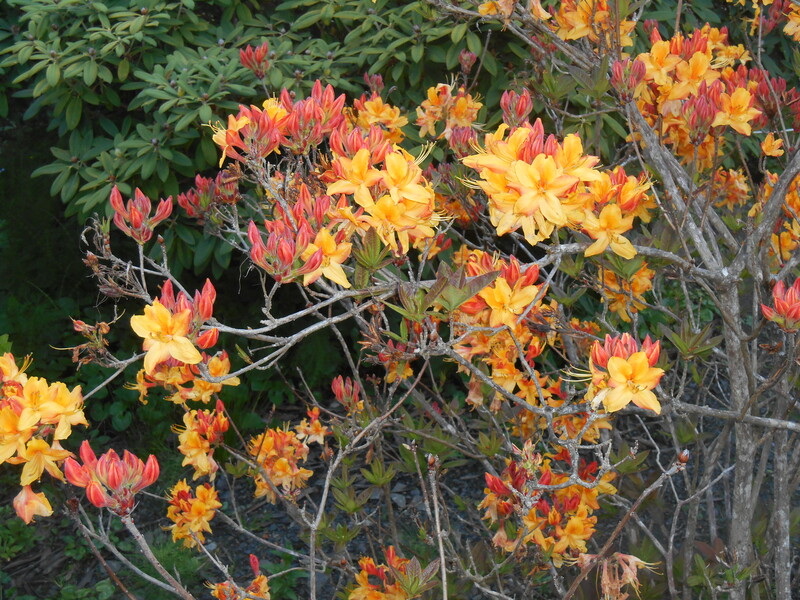 Aging Rhododendrons regenerate with new growth at the Connie Hansen Garden. Ferns cover the exposed rock work at Cape Foulweather along Highway 101 in the coastal mountains of Oregon. Travel invites us to break our routines, sharpen our senses, and open ourselves to seeing our world from a novel point of view. Back now from a week on the West Coast with daughter and her family, I am enjoying the warm after-glow of our time together as I edit the hundreds of photos which came home with me. The weather was fine during most of my visit, and so we spent as much time as we could playing on the many beautiful nearby beaches, or letting little one run and explore at the Connie Hansen Garden Conservancy. I was very pleased to see the upgrades and improvements to the garden there, all accomplished by devoted volunteer gardeners. A sunset walk at the Connie Hansen garden revealed this beautiful glade beneath old Rhododendrons. I watched as my daughter tended her own garden, and as she tended this beautiful child. It takes great vision, patience and understanding to nurture both children and gardens. We wandered together through a local nursery while little one was away at her pre-school class; I indulged in buying herbs, flowers and ferns to grow in my daughter’s garden and in her care. 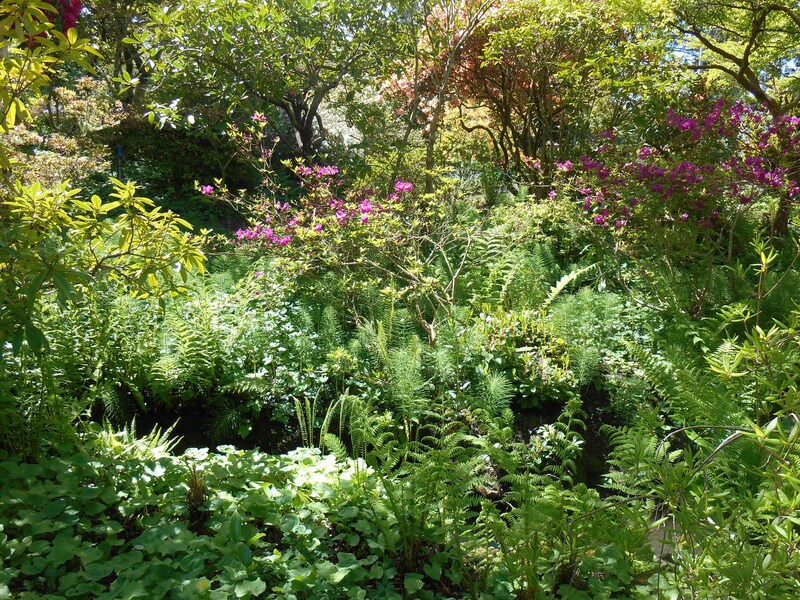 Beautiful native and exotic ferns fill the shady spots at the Connie Hansen Garden. 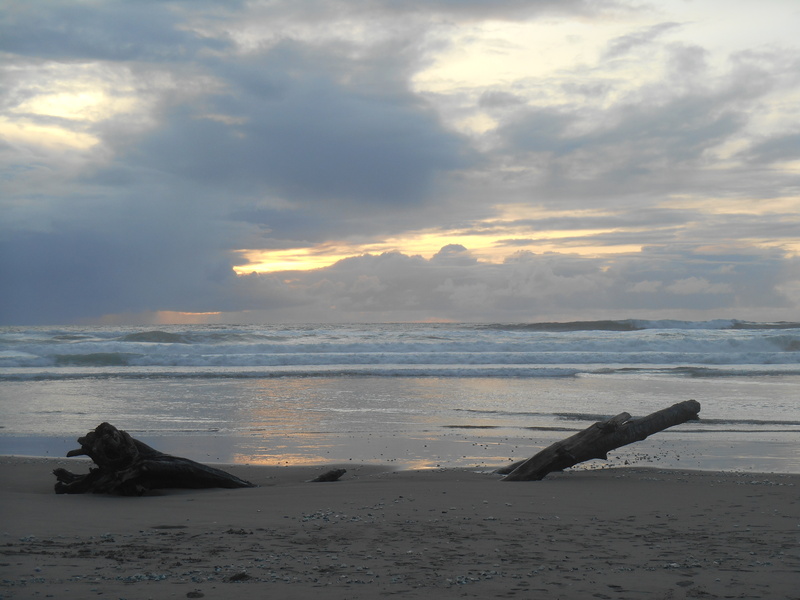 There was so much to enjoy and to feel glad about on this visit to the Oregon Coast. 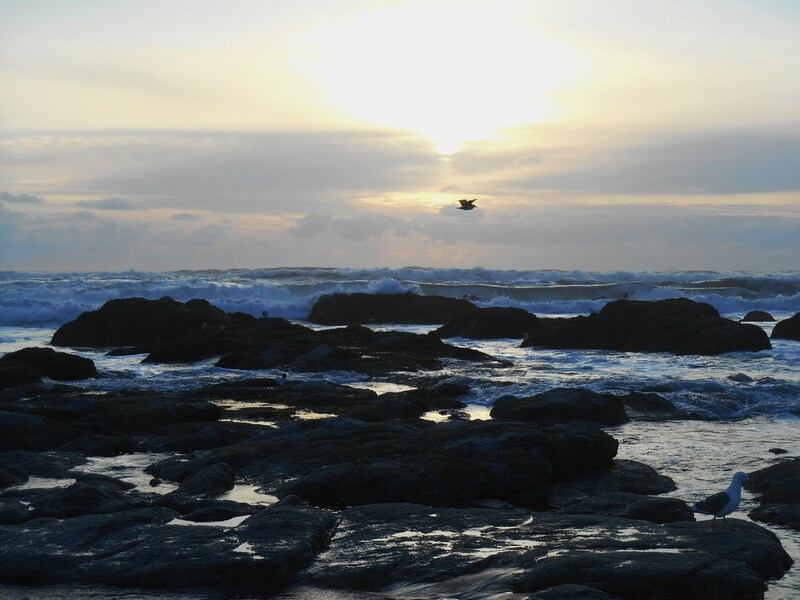 I was delighted to find abundant life in the tidal pools and around the rocks which line the coast. I have come home energized and inspired. Even as I unpack, re-organize and readjust to Eastern time; my mind is teeming with ideas to tend and improve my own garden. I’ve photos to share, trees to sculpt, bulbs to plant and plans to make with friends. I made this for a friend one evening, after little one and her mom went home. Now I am filled with ideas for incorporating sculpted trees with slices of geode to make unique pendants. 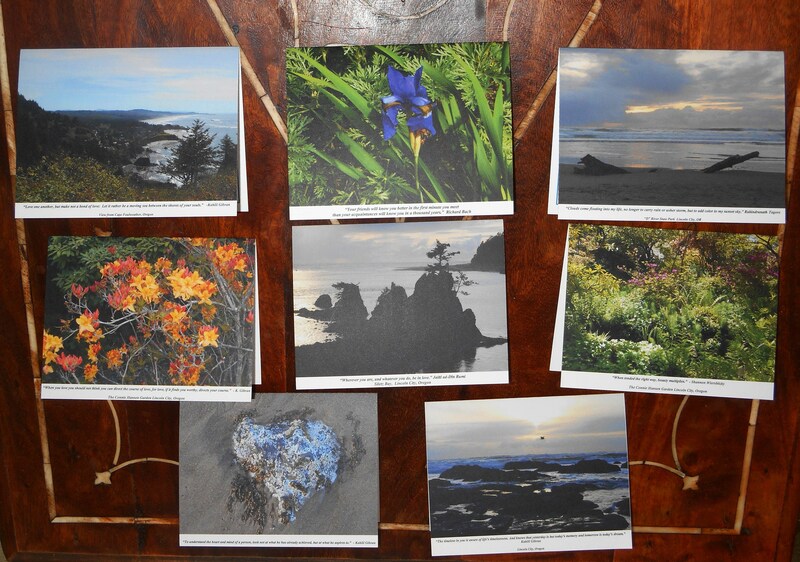 There will be a new line of note cards with photos taken in Oregon. 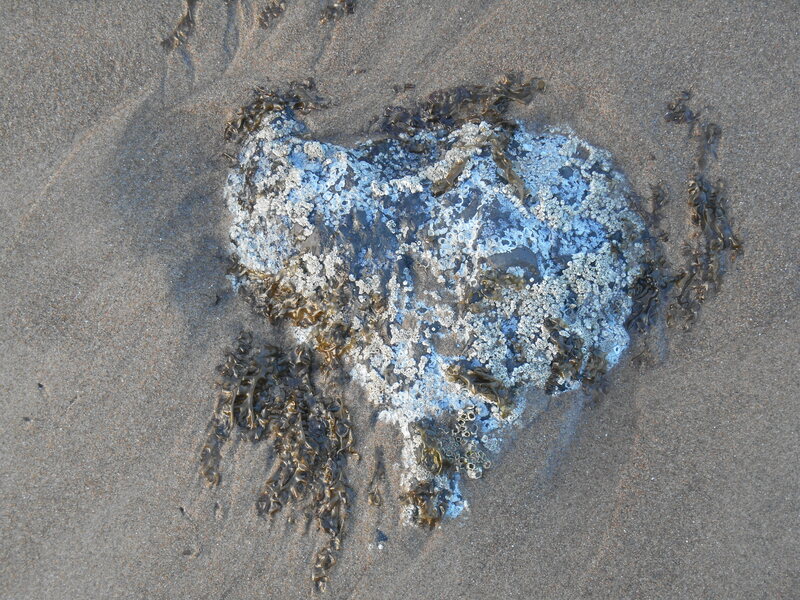 And, I came home with heavy suitcases because I picked up so many beautiful rocks from the beach! I’ll soon use them as bases for the trees I plan to make over the next few weeks. 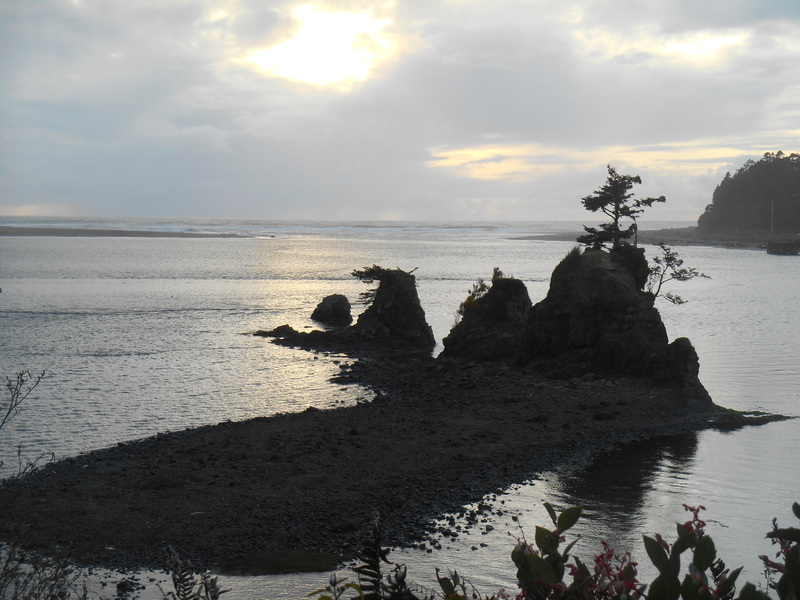 What an unusual view of Siletz Bay, with the tide completely gone out. These trees remain an inspiration to me as I combine organic and mineral forms. So fair warning: I have many photos left from my trip to share here at Forest Garden during the coming weeks. I hope you won’t mind too much.. I remain intrigued by how the same plant grown in Virginia and grown in Oregon can come to look so different. Climate and soil make all the difference. And I am endlessly fascinated by the magic that always greets me in Oregon. Gorgeous Fuchsia grows at Mossy Creek Pottery near Gleneden Beach, Oregon. Fabulous Friday: Happiness is contagious…. Isn’t this a great word for October? Especially as we prepare for that most transformative of holidays, Halloween or Samhain; when we focus on our fear of change. This isn’t the sweet and uplifting change of bare branches breaking into springtime blossoms and emerging daffodils. We now find ourselves at the other side of the wheel of the year: Autumn, where our garden begins to disintegrate as we head towards winter. Rudbeckia fading in our garden as the Salvia keeps getting better. Flowers transform into dry seedheads; leaves lose their green and blow down from our trees onto the lawn. Frost kills our tender annuals, and much of our garden withers. What was so lovely a few weeks ago has grown grotesque. Green stems turn brown, then grey. Plump and healthy plants twist and shrivel. We’re left with frost blasted perennials and the naked skeletons of trees. And we find ourselves left with this mess to tidy up sometime between now and the coming spring. A once mighty tree turned into driftwood, on an Oregon beach near Pacific City. But since both spring and fall are simply two sides of the same annual cycle, we also find closure and balance in autumn’s path. There are ripe seeds to gather and sow, perennials to divide, and fruits to harvest. There is beauty in the garden, still. Basil and Salvia in our garden this week, where ripe seeds stand alonside new flowers, much to the goldfinches’ delight! Autumn’s lesson reflects the wisdom of the Hindu god, Shiva: Destruction of the old precedes creation of the new. It is the lesson of compost; the truth of a seed splitting itself open so that a tender new shoot may emerge; the dark wisdom of all fertility. Gardening is about transformation. Our only constant remains constant change. And transmogrification, our garden in autumn, prepares the way for a new springtime beginning. Re-blooming Iris ‘Rosalie Figee’ opens alongside Allium seeds and Rudbeckia in our garden. I found the way home, a few days ago, after spending a week in one of my favorite places on Earth, enjoying the company of my daughter and her family. My heart always sings when the jet drops through the clouds low enough to catch my first glimpse of emerald green Oregon. It is a place like no other; and I treasure every hour spent wrapped in its beauty. Evergreen trees, grassy fields, budding moss cloaked hardwoods, ferns and countless Rhododendrons create a tapestry of every shade and hue of green. The air is moist and cool. We dropped low over the green Columbia River on a final approach to Portland’s airport, finding the safe pavement of the runway just before our wheels touched the water. My family was waiting, little one doubled in size since last I saw her. Our drive home to the coast wound through towns and countryside, through the Willamette Valley, across mountains and beside rocky creeks. It was raining before we made it back, and cold. Instant return to wintery weather. The ocean below the condo roared and crashed, white caps breaking all along the beach at high tide. How much can one pack in to a few short days? How many trips up and down Route 101? How many walks on the beach? How many wanderings through the gardens? How many cups of Starbucks? How much shopping, and how much listening? A wild cucumber vine growing at Cape Foulweather. There is never enough time for me to soak in my fill of Oregon. There is always more I want to see and want to do. And I was at a disadvantage this time, with allergies and a cold. The view from Cape Foulweather, 500 feet above the Pacific. But the days passed, and all too soon we made the drive back north to Portland; back to the airport. Roses were blooming around the parking lot of the shopping mall where we stopped, by the time we returned. We had gone from 40’s to 90’s and back down again while I was there. We all were suffering from the pollen laden air, even at the coast. The path down to Beverly Beach. I enjoyed a small slice of Oregon’s spring; a few beautiful days while the landscape was still waking from it’s winter slumber. Clumps of Zantedeschia bloomed in nearly every yard. Rhododendrons as tall as trees were bursting with huge bright flowers. Primroses carpeted the ground, and ferns stretched their fronds from tiny fiddle heads to tall scapes. Azaleas bloomed in Crayola colors; Skunk Cabbages glowed golden yellow; and blue Lobelia grew lush and large, many times bigger than they possibly could at home. One day I’ll return deeper into summer to enjoy a different view of the landscape. But for now, I’ve tried to memorize every detail of April in Oregon. And still my own garden called across the miles. An order of trees arrived earlier than expected. The rhizomes and tubers planted weeks ago broke ground in the garage, reaching for the light. Weeds took hold amongst the moss. Our first Iris bloomed, Dogwoods lost their petals, and our ferns, too, are unfolding. I got daily updates from my partner, who stayed behind at home to feed the cat and tend the garden in my absence. One of the earliest Irises in bloom at the Connie Hansen garden, perfectly matched to the Azalea behind it. And the day finally came for the long journey home to Virginia. Begun before dawn, we finally pulled back into our own driveway in the wee early hours of the following morning. Weather along the way delayed my final flight, making us last plane to land well after midnight, and just before Richmond’s airport shut down for the night. Beverly Beach, my last full day in Oregon. The night air was sweet and moist. Deer and raccoons congregated along the highway. We sped through the early morning hours sharing stories and enjoying the empty road. Travelers always return with fresh eyes, and new appreciation for the comforts of home. I have made this journey enough times now to have a sense of ‘home’ on both ends of the trip, which is a tremendous blessing. Loved ones wait for me on both coasts these days. Both places hold their own special beauty. I’ve gathered a few fresh ideas to try in the garden, and perhaps a few fresh perspectives from time spent with my daughter, too. She is always teaching me, in her own wise and loving way. The Maidenhair fern native to Oregon isn’t so very different from the Maidenhair fern we can grow in our garden. I will experiment with growing this tough and beautiful fern, which looks so fragile. This one grows in the Connie Hansen Garden. And Virginia ‘s greens are lovely, too. I’ve spent a lot of time, since returning, lingering at the windows, reacquainting myself with our own familiar landscape. There is much waiting for me to do, now that I’m home again. 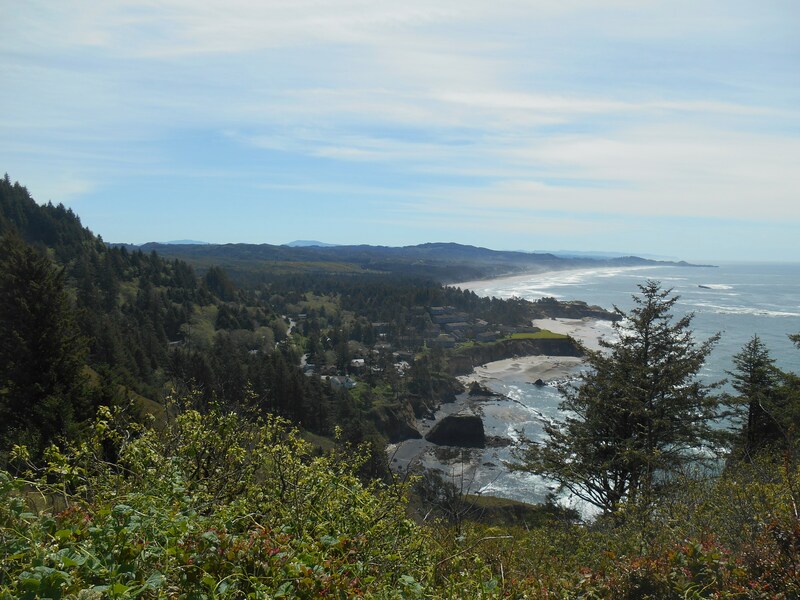 After all, it is still only April…..
Oregon’s central coast, along Route 101 near Lincoln City, is one of the most beautiful places I know. And one of my pleasures, while visiting there, remains taking photos of its magical beauty. The Connie Hansen Garden in late April. I’ve just completed a series of note cards featuring some favorite photos from my trip in April, including a few photos taken at the Connie Hansen Garden Conservancy. I made these cards as gifts for friends and family, but have a few sets left to offer to you, here, at Forest Garden. This set of 8 note cards, with envelopes, is now available for purchase. Eight different photos, each with a quotation from one of my favorite authors, make up this set. These are 5.5″ x 4″ folded cards professionally printed on heavy stock, with envelopes. 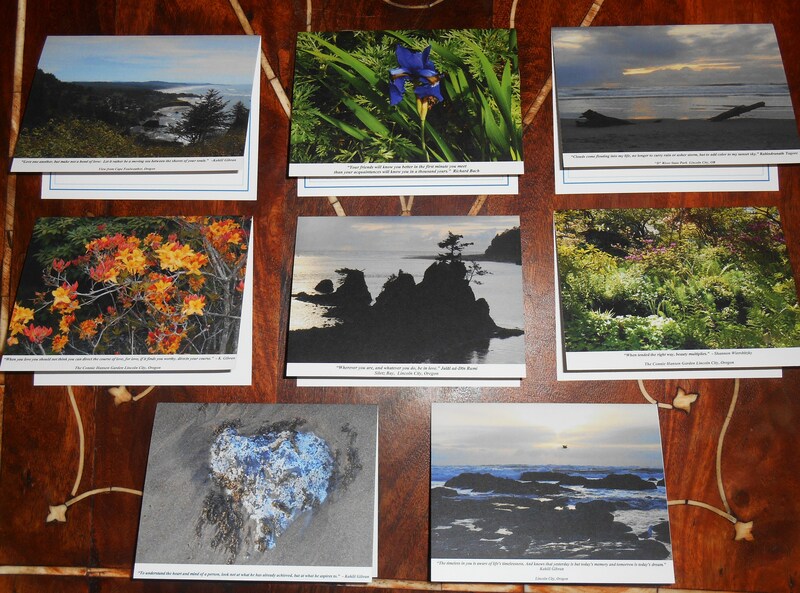 Each set of 8 cards is offered for $15.00, which includes postage within the United States. Please write to me at woodlandgnome@zoho.com if you would like to order a set. Native Azaleas blooming in the Connie Hansen Garden. If you would prefer a custom mixed set of some cards and not others, I will do my best to provide that for you. Each of these photos holds a special memory for me. I hope you will enjoy them as well.